Wild Day at the Wildlife Center. 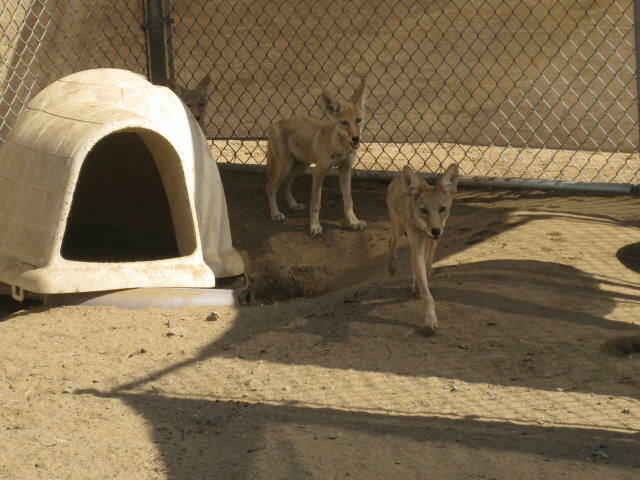 I was asked to clean the coyote run – a large fenced in area with two sections – I was told to just chase the juvenile coyotes (too young to be released yet) into one section, close the gate, clean the empty section, and repeat the process for the other section. I’d never been in there before, because I have not had the preventive rabies vaccine. Therefore, if I got bit, the animal would have to be put down, and I would have to get the regular shots-in-the -stomach rabies vaccine. The woman in charge said not to worry, that the coyotes would just run away from me, which they did… mostly. I cleaned the first section, after getting them all, or so I thought, into the other section. I had counted 3 coyotes. I cleaned the section I was in, made sure the 3 coyotes ran into the other section, I shut the gate, then cleaned the second section. I came back to feed the coyotes a little while later, and was quite surprised to count 4! 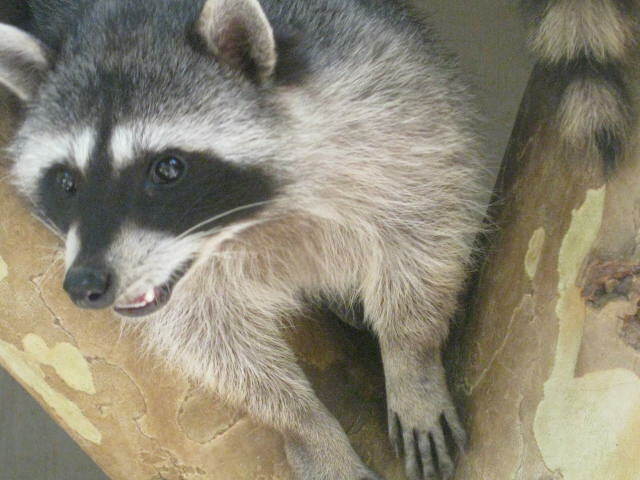 One had been hiding in a black plastic tube they like to play in, and didn’t move at all while I was in there cleaning up the poop, or he had run so fast into the other section, I didn’t see him. I’m glad these critters are not generally dangerous. It is kind of surreal to be in such close contact with animals I and just about every one else never sees, or views only at a great distance. And here I am very close to these animals, sometimes even handling some of them. If I remember correctly, I had not even seen an owl (except on TV and movies) until I started volunteering. 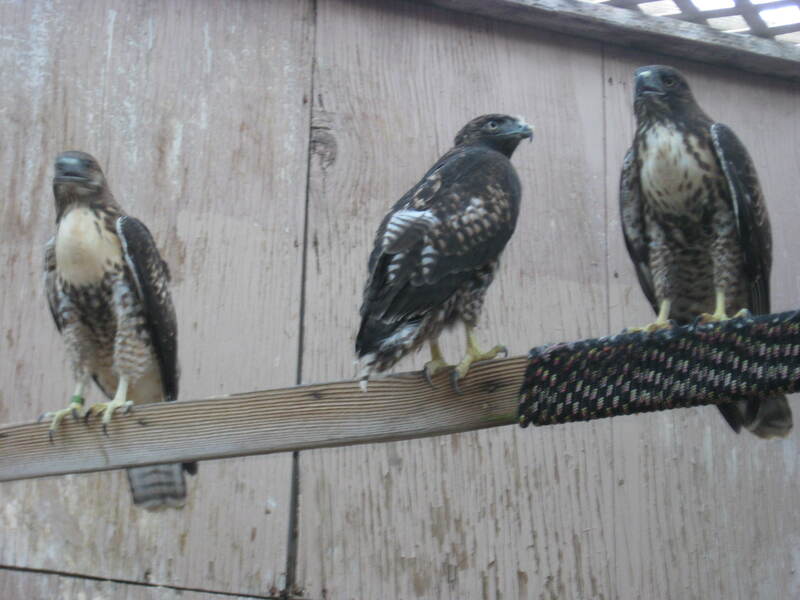 Now I clean their enclosures while they are in them, occasionally dodge the birds, and once I even got attacked by one. It’s strange alright, but I just go about my day and perhaps sometimes it is only at the back of my mind that it feels strange. I do my work. After the coyotes, I fed the juvenile pelican (wish I’d gotten a picture of that bird! It was silver! ), cleaned out the duck area alongside the little pond in back, fed the ducks and goose, fed the gecko some crickets (the lizard is not indigenous, someone found him and dropped him off at the wildlife center so he could be adopted), fed a turtle, fed a hawk, and then went to spend some time with 2 of the resident birds. One of my responsibilities, and often the best part of the job, is to handle the resident animals to keep them comfortable around people. We have a non-releasable raven. He likes people to come and visit him in his room, but does NOT like people to try to pick him up. I don’t know why. Also, for reasons I do not know, he strongly prefers the company of women. The bird was not exactly stoked about me trying to grab him. I had just eaten a fairly large meal while on break, and shortly thereafter was chasing the raven round and round his cage for 15-20 minutes. I had to stop, sit on a log and rest for a little at times and let my food digest. He’d wander around slowly and we’d just look at each other. After many, many attempts, I finally snagged his jesses – this involved getting almost at eye level with him as he was on the ground, and keeping my face away from his beak in case he went for my eyes. I wear glasses, and that helps. I also wore the thick gloves, which is good, since he bit my hands several times, and damn did he squawk!! And this is a tame bird!! You know, I don’t think this is a good method for keeping a bird on friendly terms with people. I finally got him and connected the leash – it’s a dog leash with a clasp – to the jesses so he could be held securely on my glove – the clasp goes through the little holes in the jesses, which are attached to the anklets, which are attached to his legs – and I took him out to the front parking lot. He was a lot better than I thought he would be. He didn’t fidget too much or pick constantly at his jesses. An older volunteer (a woman.. remember, this raven strongly prefers women), who has been on staff for years, came outside to pet him, give him a birdie massage, and feed him some grapes. He liked that. I held him for as long as I could – he’s definitely heavier than the barn owl I spend the most time with, and am used to holding. I was later told not to try and hold the raven. Chasing him down causes too much stress. 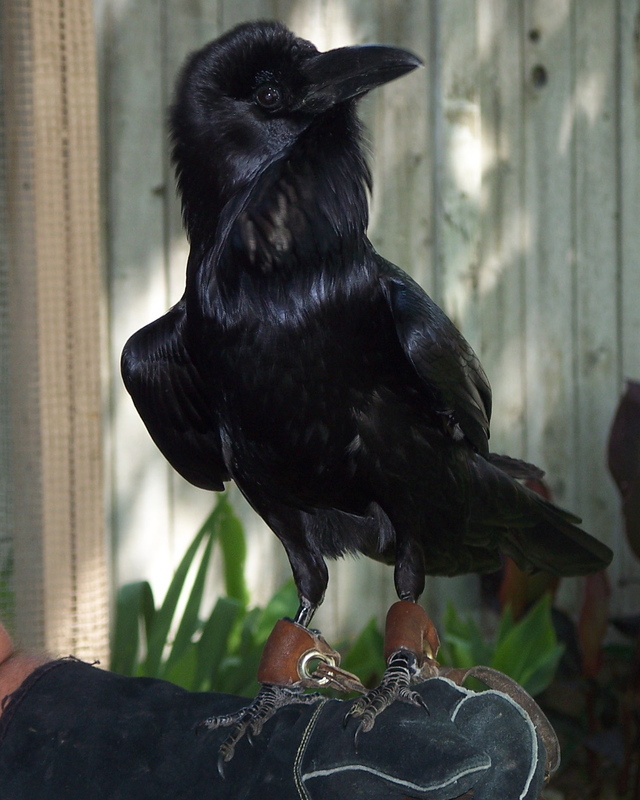 I was also told that even most experienced animal handlers, those who had worked with the raven and many other critters for many years, still had trouble catching the raven to hold him. Mostly, it took two staffers to get the raven on one of their gloves. I won’t be trying to hold this particular bird anymore, I’ll just visit him in his room, and bring him his favorite treat, dead mice. After a little while, I brought the raven back and went to a room where a tiny owl lives with much more space than he will ever need. Unfortunately, due to an injury, this bird cannot fly, and is therefore, non-releasable. His injuries were not near bad enough for him to be put down, and some folks on staff were allowed to tame him. 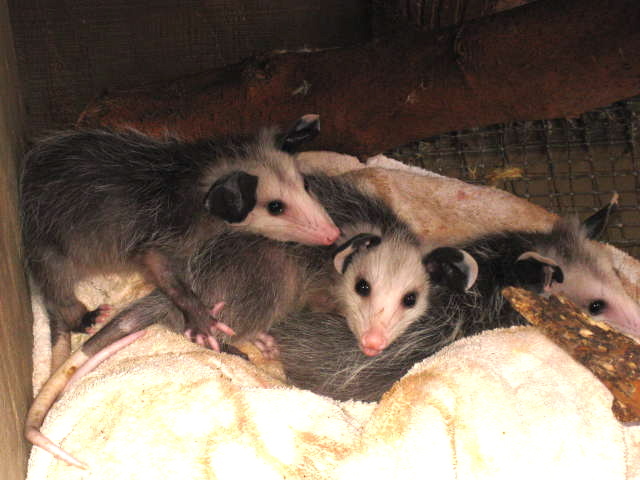 Wild animals are not legal to keep as pets, but staff at wildlife rehab centers with special fish and game permits are allowed to tame and keep wildlife at the centers. If you’ve seen the movie “Hoot” (I haven’t, but I’ve seen the poster for it) you’ll notice that this is the kind of owl that’s in the movie. Very small owl, but quite brave. I walked in there, and this little guy ran out at me, stood up tall, and chittered away trying to scare me out of his room! He does this often when I come to visit him. He’s really something to see. I had a much easier time chasing him down, compared to the raven, although this owl can sometimes be hard to catch. Once I got him on the glove he was calm, as he always is. He is the easiest bird by far to hold – not only the lightest, but the calmest. 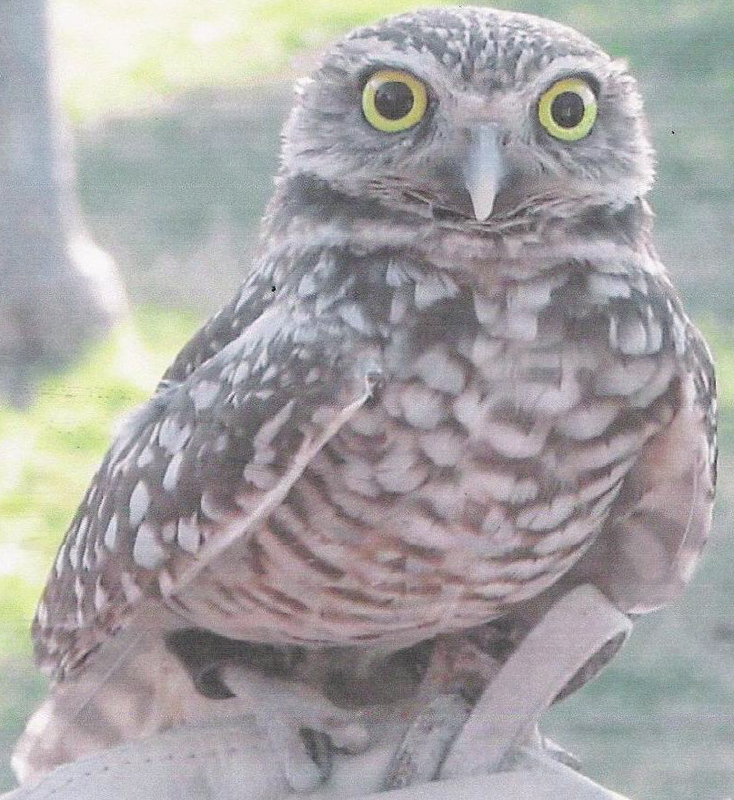 I held him for a little while, sitting down at a picnic table, talking to him, petting him a little, looking into those owl eyes, then returned him to his room. It was great to hold the raven and the owl, watch the coyotes, and care for the other animals.